We recieved a very interesting article by one of our readers living in Kenya. Check what he has to say about vandalism of electrical equipement in his country. You too can send us testimonies and more by mail. I live in a small town called Kikuyu population, 300,000 (most of them lively people) near Nairobi, Kenya. Well, the factors that test our lively nature include frequent power losses, transformer sabotage and vandalism. The vandalism and thefts happen approximately twice per month, leading to massive business losses, disrupted routines and loss of income. According to the Kenya Power Company Limited (KPLC), our region has incurred them 11million Kenyan shillings (approximately $140,000) in the last six months. Within the last five years, the company has lost close to Ksh 1.7 billion ($24 million) in replacement costs and lost sales due to vandalism. There is a huge demand for copper wire in the country, especially in the black-market automotive and cable industry. The vandals then deem transformers as a one-stop shop for large hauls. The transformer oil is mixed with regular cooking oil for sale to the numerous fast food and roadside food vendors, especially French fries. This is based on the high resistance to vitiation and degradation, high-temperature stability, which directly translates to more cooking sessions with a unit amount of oil. The scrap metal industry thrives in Kenya. Therefore, the copper windings, aluminum and steel from the transformers are sold to the informal sector workers, mainly comprised of welders. In the recent times, the vandals have gone a step higher and exported the scrap metal. 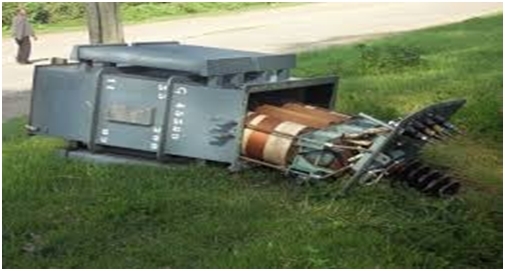 Late last year, a transformer stolen in Nairobi was found installed for a consumer in a neighboring country. More skilled vandals, or should I say daredevils, focus on the transmission towers, which have more metals for sale and export. “In response to the problems, the company has come up with some noble and not so noble solutions to the problem. For starters, even in our town, the first attempt at deterring vandals was nothing close to professional. The technicians by-passed the fuses, such that even after removing the fuse, the system would remain energized. Well, this did lead to a number of electrocutions and severe burns, and vandalism reduced for a few weeks before the vandals appraised themselves on the measures. Beam sensors to detect the approach. There is an integrated alarm system, CCTV and shock detectors to detect vibrations and shifts. The detectors are then connected to a central command unit for monitoring and response. “From the highlighted information, it is evident that the vandalism is a recurring headache in our region. The solutions, especially the not-so noble ones, do work in scaring away the culprits. However, the current high poverty levels, and the general notion that the transformers and utility systems are government property, rather than installations to help us out, still fuels the vice. Thank you for reading my testimony. Do you have the same problem in your country? or copy this trackback: http://engineering.electrical-equipment.org/others/vandalism-and-theft-of-transformers-testimony.html/trackback from your own site.